Sometimes the best ideas can come from desperation, and that seems no more apparent than in Justice League 3000 Vol. 2: The Camelot War. I find it hard to believe the twist in this story was planned from the start, but be that as it may, it's what got me reading Justice League 3000 in the first place. As in the first volume, this book is well-plotted, though the repetitive bickering between writers Keith Giffen and J.M. DeMatteis's stock Leaguers Superman, Batman, and Wonder Woman grates after a while. The book is invigorated considerably, however, by the addition of two of the writers' best-known characters, whose voices are so synonymous with Giffen's brand of unfunny funniness that it seems less gimmicky and more natural. Also helpful are a couple of new-old characters (new characters in old bodies and old characters in new bodies), whose voices as well freshen the patter that threatens to grow stale. The juxtaposition of one story ending and one beginning in this book cancel one another out. Though arguably we find the climax of the first storyline halfway through Camelot War, this feels like an interstitial trade that's more set-up than real content. That's not bad per se, though these kinds of things work much better when a series has ten trades, not four. Still, this volume ends on an up note, promising the culmination of what I've been waiting for this whole time. 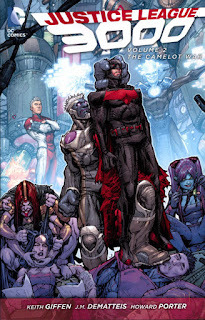 In my review of Justice League 3000 Vol. 1: Yesterday Lives, I remarked how similar this series is to Giffen and DeMatteis's Justice League International; in Camelot War, we find it's not just like International, but rather it is International. Bless the loose continuity of DC You (unless we're still to find a Rebirth tie here), but it's not so much the arrival of Blue Beetle and Booster Gold as when Ice Tora Olafsdotter recognizes Wonder Woman as her former teammate, mentioning the JLI specifically, that we understand that we really are somewhere else. Yesterday Lives involved the resurrected League learning about this new futuristic universe, on behalf of the audience, surrounded by unfamiliar faces. Camelot War offers a new dynamic, to play out in Justice League 3001, in which these amnesic Leaguers will now encounter characters who actually knew them previously. Quite aside from the fun next time of seeing Booster, Beetle, Ice, and others back together, this'll be a curious turning point for the League 3000 to learn about their old selves from more reliable sources -- as well as how the immortal Ice can help fill in the gaps between the present day of whatever continuity these characters come from and now. Giffen and DeMatteis use this book's permeable door between life and death well. Not only have the writers shown they can cameo pretty near anyone (including Etrigan the Demon), but Camelot War's biggest surprise was their resurrecting "Wonder Twin" Teri just an issue after her brother Terry betrayed the team and murdered her. Though poor Barry Allen's been killed twice here, Teri's all the more interesting with Barry's powers, not in the least again because it gives the writers a character for the others to play off who's not as antagonistic as the original Leaguers. The effect is almost immediately noticeable, perhaps intentionally, in the softening of both the Superman and the Wonder Woman characters in specific. At the same time, these resurrections come with a cost, and League challenges the characters to consider whether the greater good really outweighs individual sacrifice. We learned in the last volume that a person essentially dies every time a Leaguer is resurrected; here, there's a specific scene of a woman dragged screaming to her death as Terry tries to bring back the Injustice League, but similarly the League's Ariel Masters kills someone off-camera to bring back Teri. That's a curious choice on Giffen and DeMatteis's part, making horrific the bad guys' bad deeds but sanitizing the good guys' ones, and I'm curious to see the Leaguers make a full reckoning of this before this whole thing ends. JLA's Howard Porter does fine work here again, with both futuristic backgrounds and majestic medieval scenes. Porter, with direction from Giffen I believe, also has a variety of tilted or otherwise irregular panels that give the pages an interesting bent. Equally the Hi-Fi colorist provides pages a well-toned, almost painterly look, which further complements Porter; to me Porter looks as good or better than his late 1990s work. There's a grand, impressive battle at the center of Justice League 3000 Vol. 2: The Camelot War, but the promise of Booster Gold, Blue Beetle, Ice, and Fire meeting the League 3000, plus the threat of the resurrected Injustice League, makes it seem the big events are still to come. Keith Giffen and J.M. DeMatteis write a Booster Gold/Blue Beetle spotlight issue here, which in and of itself makes Camelot War something worth checking out, but I'm eager for the penultimate volume of this series to finally get to the meat of the story.